Peace Blue Resort Naiharn Beach Phuket is the latest naturist resort in Thailand. The resort is owned by Patty and Golf who rented and managed since July 2016 the “Lemon Tree Resort Naiharn Beach Phuket” - the first naturist friendly resort in Phuket. The new resort, Peace Blue Naiharn, opened October 2018. ":Peace B)ue Naiharn" aims to fulfill the increasing demand of naturist guests who are travelling to Phuket for the comfortable and clean accommodations with friendly safety environment and convenient facilities as well as delicious foods and drinks, massage service and personalize service. We at Peace Blue Naiharn aim to provide all our guests with the right amenities for a true naturist friendly environment at its very best. We believe that by getting in touch with nature without clothes will allow our guests not only to feel totally free, it will also be great for one’s health and wellness. More importantly, being able to build a strong social relationship among our guests around the pool, garden area or at our in-house cafe, will be an inspiration to all who wish to join in conversation. While the guests enter the resort, they will find all their needs i.e. swimming pool, bar and restaurant, sauna and massage. Once they take their clothes off, no need to go out from the resort. They can enjoy naturism and socialize with other naturists. “:Peace B)ue Naiharn” is nestled in one of the most popular tourist areas of the tranquil Naiharn Beach south of Phuket Island. The resort is an hour from the Phuket International Airport and only a few minutes drive from Rawai Beach and Naiharn Beach. Yet it’s also in close proximity to a variety of places in which to shop, a convenience store and many acclaimed bars and restaurants. The Tesco Lotus Express and the 7-11 convenience stores are only 100 meters from the resort. Furthermore, the pubs, bars and restaurants are all within walking distance from the resort, less than 500 meters away. And just to make things easier, the resort is happy to provide you with a bicycle at reasonable cost, should you want to go cycling. For seafood lovers, you simply have to try the outstanding selection of fresh seafood on display at the Rawai market. This market is where you can choose your own fresh seafood and then at the restaurant opposite the market, ask the chef to prepare the fish just the way you like it. You are going to love it here. And the food is simply Yummy! As a naturist, the resort provides a great many activities in which to participate, such as sunbathing in the privacy of the resort or on private beaches. Socializing with friends on BBQ, movie and cocktail nights. Soothing indoor or outdoor massages. Phuket city tours and Andaman Island tours as well as elephant trekking, skyline adventures, Thai boxing, ATV trail runs, cycling and sunset escapes to the spectacular viewing point at Promtep Cape. Peace Blue Naiharn welcomes everyone into their circle of friends and family, whether it’s for a day visit or an overnight stay. And clothing is optional at the resort. While we are a naturist friendly resort in Phuket, we do not accept any open display of sexuality. That is preserved entirely for you in your own private capacity. 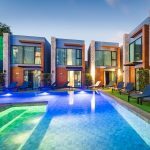 The newly completed development comprises of 7 fully furnished and well equipped suite villas surrounded around a communal swimming pool. The suite villa is elegantly Thai modern styled for your absolute comfort. It comprises of well-appointed bedroom, private plunge pool (4 villas), a kitchen and a living room. There is also 3 storey type of building which are 15 superior rooms with well-equipped facilities. The resort held a soft opening on 19th October 2018 and grand opening in November 2018 in order to welcome high season guests. Guests also have a 24-hour 7-day a week reception service as part of the accommodation. All the amenities here create an environment for a wonderful holiday as well as for a long term island lifestyle. Naturists the world over are welcome to explore a most memorable naturism experience at the Peace Blue Naiharn, Naiharn Beach in Phuket. Booking is now open to you at the resort. Peace Blue Naiharn is designed for your complete comfort and convenience for naturist vacation. Fast, friendly and home feel service when you arrive and depart, free hi speed internet use, a relaxing spa to make you feel good, a pool bar and lounge for your refreshment, chill out and chit chat or socialize with other naturist friends and so on at Peace Blue Naiharn. NUDETASTIC! more reason for us to visit Phuket fm October. Welcome to Peace Blue Naiharn in October 2018.